Pet hair, dander, and stinky smells top the list of problems associated with pet ownership. According to the American College of Allergy, Asthma, and Immunology, pet owners often suffer allergies because pets, dogs, in particular, are a good host for dust and pollen. Likewise, our furry pals produce multiple proteins in their hair and saliva that can trigger allergies. Nevertheless, that shouldn’t stop us from loving our pets, especially when there is an effective solution to our problem. I am not referring to your broom and dustpan combo. It is not enough to keep tumbleweeds of fur rolling across the floor. Your mighty Dyson alone won’t suffice. Air fresheners won’t do either, as they only mask the smell. The solution? A good quality air purifier… for pets! Air purifiers for pets eliminate allergens, dust, odors, and other impurities from your home so you can breathe in clean fresh air day after day. Most importantly, it keeps allergies at bay. So, we will share with you 10 of the best products that offer excellent air cleaning capacity. If these air purifiers don’t clean the air, we suggest you invest in a gas mask! 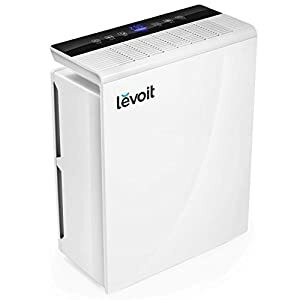 The following are essential factors to look out for to so you can find the best air purifier for your needs. A pre-filter is designed to capture large particles from the air ahead of other filters. These include insects and hair. The main advantage of having a pre-filter is that it increases the longevity of the more expensive HEPA filter by preventing clogging and dust coating. Choose a unit with an activated carbon filter if bad odors are among your concerns. It is the only type of filter that has the ability to absorb a potpourri of smells caused by your pets or your kitchen. Even a HEPA filter doesn’t have this capability. Thus, be on the lookout for this type of filter. It is characterized by a chalky texture and is black in color. The third and most important filter is the HEPA filter, which is manufactured and certified in accordance with the HEPA (High-Efficiency Particulate Air) standards. This filter is designed to trap minute particles that are floating in the air such as pollen, dust, dander, and mildew. These impurities can’t be released back into the air once they are collected. Therefore, running an air purifier like this 24 hours a day ensures you have an allergy-free home. 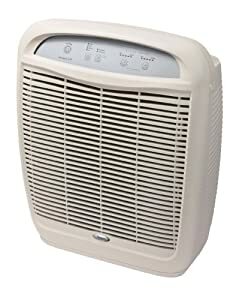 An air purifier with a True HEPA filter, however, is much better than a unit with a regular HEPA filtering system. The True HEPA filter is the highest standard of air purification, as it captures microscopic particles that are up to .3 microns in size. Some units use UV-C light to sanitize the air from harmful microorganisms. UV-C stands for “ultraviolet germicidal irradiation.” This technology has been used for sterilizing medical equipment long before it has been applied to air purifiers. The unit’s square footage rating is a crucial factor to consider. If your room measures 200 sq. 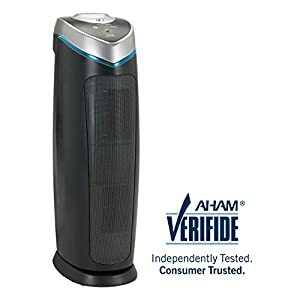 feet, get an air purifier with a rating that is above this number. Otherwise, some areas will not be purified thoroughly as the areas adjacent to the unit. As expected, an air purifier with a high square footage rating is ideal for bigger rooms. It is also suitable for houses with limited airflow or has a high pollution level. Another benefit of a high coverage unit is that it works in multiple rooms as long as the floor plan layout is open. Likewise, it is quite handy when you need to clean an area quickly, like when your mom’s cooking escapes the kitchen exhaust hood. You need an air purifier that won’t take up a chunk of space in your room. Setup should be a breeze and its control panel should be user-friendly. The better if the unit has rolling casters or a carrying handle so you can take it from one room to another. It is also nice to have a remote control. Although it isn’t absolutely necessary, it does give the user added convenience. Multiple fan speed lends flexibility and control so you achieve the cleanest air possible. CADR stands for the Clean Air Delivery Rate. It is a metric that was formulated as a method for measuring the performance of air purifiers. The CADR of a particular unit reflects the volume of air it is capable of purifying within a specific room size. It is measured in cu. feet per minute. Basically, the higher the CADR number of an air purifier, the more clean air it delivers. The highest CADR is 450. Cutting-edge air purifiers are equipped with Smart Sensors that gauge the air quality of your room and will automatically adjust the fan speed to achieve optimal air quality. Likewise, it will turn off automatically after running a few hours if you set it to. This feature makes the unit more expensive but it is nice to have an air purifier that will shut itself off when you leave for work. A service indicator alerts you when the air purifier needs filter replacement. Depending on the model, it gives a sound signal, an indicator light, or a notification of the LCD display. Unless you love the whirring sounds of a motor engine, choose a unit that is calibrated to operate at a much quieter level. We suggest that you get a larger unit and run it on a low speed rather than crank up a smaller unit. Consider the maintenance cost along with the upfront price of the unit if you are keen on budget. If pet hair and stinky odors are your main concerns, you may want to skip the more expensive units with a HEPA filter. 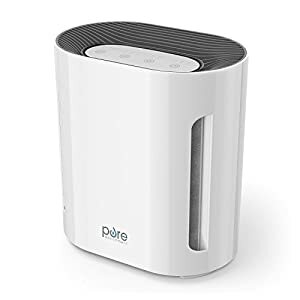 But if you want the freshest and cleanest air possible to avoid allergies, opt for an air purifier with three filtering systems including a True HEPA filter. It is plain to see that this unit tops all others because of its PlasmaWave Technology, which is extremely lethal to bacteria, viruses, and microbes. Plus, its Advanced Odor Control eliminates the most offensive odors in your home including smoke, musty odors from moistened wood, and the stench of a poisoned rat! Moreover, the Winix WAC9500 is equipped with a LED control display. You will be alerted when it is time to replace the filters. More or less, the filters can last for a year and you can wash the pre-filter and the carbon filter in between uses to help you save money. It also indicates air quality. The LED display will show a red light if the air quality is poor. With Smart Sensors and an automatic operating mode, it will automatically adjust the fan speed to meet the needs of the environment. Likewise, it has an auto dim feature that adjusts the brightness of its LED display depending on the amount of ambient light in a room. With a remote control, you can operate this unit from a distance. It even has batteries included with it. You can choose low or medium for a quieter operation and high or turbo for optimal air-flow and cleaning power. The only downside of this unit is its size. It is as large as carry-on luggage and it has no rolling casters to boot. Other than that, the Winix WAC9500 Ultimate Air Purifier for Pets is made to perfection! Equipped with Smart Sensors, air quality meter, etc. The runner up goes to this sleek air purifier by LĚVOIT. The LV-H132 is the perfect choice if you have a naughty pooch who farts without remorse. It features a three-stage filtration system that works effectively in improving the air you breathe. What makes this unit the best for pet odors is its activated carbon filter that is derived from coconut shells. Know that coconut activated carbon filters are the number one choice in the air and water purification industry. It eliminates not only dander and fur, but also herbicides, pesticides, and volatile organic compounds found in paint, wood preservatives, and cleaning supplies that you never thought you’ve been inhaling. Additionally, it has an optional night light. It quietly functions throughout the night so you and your furry pal can sleep soundly at night. If only this unit has more than 86 sq. feet of coverage, you could have used this for other areas in your home aside from your room or office. Moreover, the LĚVOIT LV-H132 is not equipped with an ultraviolet bulb or ion generators. This product is 100% ozone-free, which is an advantage for the environment. Contrary to popular belief, you don’t get allergies from pet hair but from the microscopic dander that your pet sheds. Even small pets such as guinea pigs and sugar gliders produce dander that causes allergy symptoms in humans. 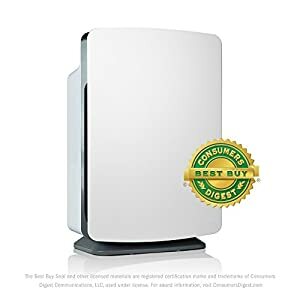 So if you’re sneezing all day, it is time to get your hands on the best air purifier for allergies. Enter, the Hamilton Beach 04384 Air Purifier. Whether you live in a dusty environment or have a dog that sheds a lot, its three-stage filtering system ensures you won’t be seeing tiny junk floating in the air. 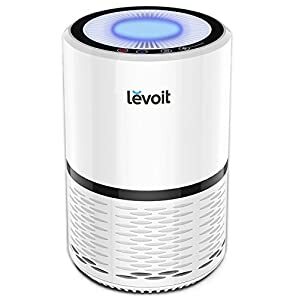 With two zeolite filters, this little machine can pull out gases, fumes, and volatile organic compounds that could also trigger allergies. It has three-speed settings so you can create a cleaning routine that works best for you. If you’re budget-conscious, you’ll be delighted to know that both its pre-filter and HEPA filter are permanent. You just need to vacuum-clean the filters to keep them efficient. Likewise, this has 140 sq. feet of coverage and can be positioned vertically or horizontally for added convenience. In spite of its reach of 155 sq. feet, it is a highly efficient machine that comes at an insanely low price. This unit has a CADR rating of 118 for dust, 125 for pollen, and 108 for the smoke. You should keep one thing in mind, though. The UV light is distracting, especially when you are trying to get some sleep or watch a flick when the lights are out. You could, however, turn it off the UV or cover it with black duct tape! 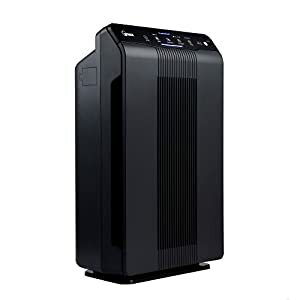 The Whispure APK51030K Air Purifier is designed to deliver an incredible air circulation rate of up to 500 sq. feet. It highlights a 4.8 ACH Rating (Air Changes Per Hour); hence, your room will have a continuous supply of fresh, clean air. Likewise, it boasts of a 315 CADR. This unit also has an Energy Star label, which means it helps you save from eye-watering electricity bills. 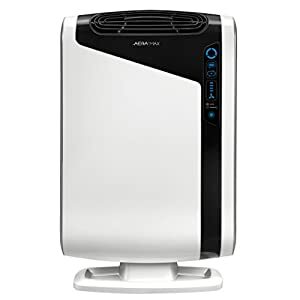 Moreover, the Whispure APK51030K utilizes a three-stage air filtration comprised of a pre-filter, carbon filter, and a True HEPA filter to ensure airborne contaminants are eliminated before it reaches your lungs. You only have to change the carbon every three months and the True HEPA filter every 12 months. Additionally, it comes with two intuitive features: Sleep mode and Turbo mode. Adding to that are four fan speeds so your unit can adapt to any situation in your home. As its name suggests, this unit operates like a whisper. Maximum coverage of 500 sq. ft. Struggling with pet hair every day? You need the Winix 5500-2 Air Purifier to win your constant battle against pet hair and dander. This unit comes with a permanent pre-filter and a washable AOC carbon filter. The front panel is easy to remove for bi-weekly cleaning and for HEPA/carbon filter replacement. Equipped with a True HEPA filter, this beautiful black machine traps 99% of airborne contaminants that are as small as .3 microns. These dust mites, pollen, and other allergens that are invisible to the naked eye. Just like other winning Winix products, this model features PlasmaWave technology that sterilizes the air from harmful pathogens. 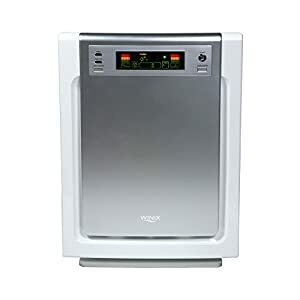 Moreover, the Winix 5500-2 is complete with Smart Sensors that gauge the air quality of the room and it will operate accordingly to optimize its condition. Additionally, it has a Sleep mode to provide a noise-free clean while you sleep. It also comes with a remote control with a battery pre-installed should you wish to operate it manually. With a sq. feet rating of 360, you can use this unit for multiple rooms as long as the floor plan layout is open. For the price and the feature list, this unit is a steal! The AeraMax™ 300 is scientifically proven to effectively eliminate airborne irritants that cause allergies and asthma flare-ups. In fact, this unit bears the certification mark of the Asthma & Allergy Friendly Certification® Program. Its best feature is its 4-stage hospital-type of purification, which includes a carbon filter and a True HEPA filter with AeraSafe™ antimicrobial treatment. It has three fan speed settings and an Aera+™ Mode, which is extremely effective at keeping flu and cold viruses at bay. Regardless of fan speed, this unit works at very quietly. Adding to that, the AeraMax™ 300 is equipped with AeraSmart™ Sensor that gauges the air quality and automatically adjusts the fan speed for optimum results. Likewise, it has a user-friendly touch display panel. This model is available in black, as well as in sizes for rooms measuring 200, 400, or 600 sq. feet. As its name hints, this unit offers custom panels and filter options. In case you want to prioritize deodorization, the HEPA FreshPlus filter would fit your needs. Afraid of germs? Then the HEPA-Silver filter is the best option. Lastly, the HEPA-OdorCell filter is ideal if you plan on reducing aggressive odors such as chemical emissions and tobacco smoke. The Alen BreatheSmart is powerful enough to trap 99% of airborne contaminants in a 1,100 sq. feet of space. When auto mode is on, it uses SmartSensor technology to gauge the air quality and adjust its settings accordingly when auto-mode is on. Likewise, it employs the WhisperMax technology to make each operation virtually inaudible. The LĚVOIT LV-PUR131 is definitely an attractive machine with its sleek lines and fresh white color. It has three fan speeds, a sleep mode, and an auto mode. With quiet operation, many would surely welcome this unit to their homes and offices. 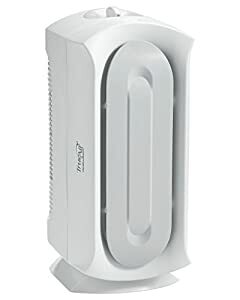 It also comes with a rail and at 11.4 lbs., this air purifier is a cinch to move around. In terms of efficiency, this unit has enough power for a 322 sq. feet room. It also offers a decent odor reduction. Likewise, this unit comes with a very enticing price tag and is also certified Energy Star. The PureZone 3-in-1 air purifier would be a great choice if you are sensitive to noise. This unit operates in an even hushed noise on its low setting and emits a peaceful subconscious white noise on its high setting. Its crisp shining curves and airy white color is a breath of fresh air, considering that a majority of air purifiers come in a bland design. It highlights a simple set of illuminated buttons in its control panel that is as intuitive as they are elegantly designed. Likewise, it has an indented carrying handle, just in case you need to move it around. This unit comes with a HEPA filter that is sandwiched between an activated carbon filter and a UV-C light filter. It has a brilliant night mode in which it extinguishes the UV-C light and runs almost silently. The only downside of this unit is the fact that it lacks the fancy features of the higher priced units. It has no built-in air quality gauge and only has three fan speeds to choose from. Although not necessary, those features do add a level of convenience. On the bright side, its filter replacements are inexpensive and its upfront cost is relatively low. It is a good value for a 100 sq. feet room but anything larger will lessen its efficiency. Therefore, we think this unit is ideal for a small bedroom. Its silent operation adds to its usefulness as you will be sleeping in close vicinity to the unit.